The principle of the DTMF technology is the following: the SL NEO server that forms the broadcast at the regional station is constantly analyzing the input audio-signal from the central station. The built-in analyzer of the Capture service checks if there are any tones in the audio-channels, detects them and forms the command for controlling every time as it finds a DTMF tone that conforms the previously set mask. In case of coincidence of the input cue-tone with the mask (according to the settings of rules for the reaction to the tone), the server automatically forms a command for playout of the local ad block and implements program switching. You may set the time of delay from the moment of detecting the cue-tone to the moment of start of playout and program switching. The end of the ad block may be detected in the same way. In this case, the server will form a command to stop the playlist with commercials and switch the source. DTMF cue-tones may be accepted and decoded by the SL NEO server from any types of input signals: SDI+AE, AES, Analog Audio, DVB ASI/IP TS. Input tones are detected automatically, you don't need any additional settings for the duration and level of sendings. · The system on the basis of the SL NEO platform allows users to implement seamless insert of the local commercials: up to twelve SD programs, or up to six HD programs simultaneously, in one system block. Let's consider one of the possible modes of server functioning: work “on pass” - one input channel that receives the signal from the center, one playout channel. When the playlist with regional commercials is stopped, the signal from the input is broadcasted to the output. When the playlist is being executed, file playout overlaps the input signal. For setting this mode you should configure the playout channel and set a background-source for it - the capture service will implement this task. You can configure this option from the control web-console of the server - menu item Status, window Program 1. You should choose the item Background in the window, then specify the type of source LIVE for it and choose the appropriate capture service Capture that receives the signal from the center. You can configure it from the control web-console of the server: menu section Manage, item Video IO Boards. Choose the item No actions Defined in the appropriate window of the capture service (Capture), then press Edit. Choose Add Action in the opened window Edit Action, choose the type of analysis DTMF Signaling and pressOK. You will see a new window: enter the parameters of a new rule for managing the analysis of input DTMF signals. Find the field Name in the window Action Configuration and specify a random name for the rule - for example, START LIST. In the field Channel choose the audio-channel that will pass the tones, or enter Any for the search of cue-tones in all the channels. In the field Delay specify the time of delay from the moment of receiving the tone till executing the command, in milliseconds. In the field Service press the button … and choose from the list the name of the service for managing. In our example it's the playout channel #1 (ProgramChannel_1 or Program_1 on the list). In the field Action choose the command that will be used when the input DTMF tone coincide with the mask - Play. 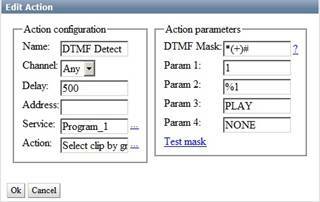 Find the field DTMF Mask in the section Action Parameters and specify the mask. 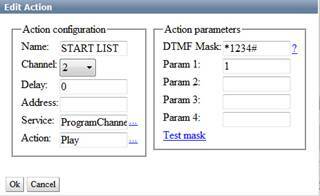 DTMF Mask is a sequence of any number of symbols, acceptable for DTMF (0123456789ABCD*#) and the so-called substitutional symbols. There are two substitutional symbols: "_" conforms any one input signal, "+" conforms any sequence of input signals, including the empty sequence. You may also use braces, to set the parts of the mask's line for using as the trigger parameters. For example: the mask "*(+)8(+)#" will conform the DTMF cue-tone that starts with the symbol "*", has "8" in the middle and "#" in the end. In the field Param 1 you should specify the layer, where the command "Play" will be implemented - choose "1", the main fullscreen layer. Then press OK to save the settings, click Apply Changes at the top part of the control console window of the server. Herewith, the configured capture service will be reloaded. You may use the same way to configure a few rules for the start and stop of playlists, for several playout channels. The appearance of a playlist with ad blocks is displayed at the picture. The lines with the type of start Manual are used as separators. In our example we don't consider the variant, when the number of the ad block is sent in the DTMF mask, so the playout of regional blocks in this case will be implemented in turn, from one Manual line to another. Note: the algorithms and the degree of audio compression when passing the signal from the center may have a bad influence on decoding the DTMF tones at the receiving side. If you want to rate the quality of decoding, you can use the message window of the Capture service: right click on the icon SL NEO Server Icon in the Windows tray, find the item Messages, choose the window Capture. Let's consider the following example: a tone with the type *123# is sent from the center: "123" is the number of a regional ad block that should be broadcasted. There is a special attribute in the playlists of SL NEO servers - a group name that contains one or several lines. Lines that are placed successively and belong to one group may be brought together in one group line, which will be displayed in the playlist as one event. This function is useful, when forming advertising blocks. Groups are named in the field Group when creating the playlists. Configuring the rule for the launch of the group line is similar to the procedure described earlier. In the field Action choose the command that will be executed while detecting the DTMF tone: Select Clip by Group. You should enter *(+)# into the field DTMF Mask of the window Action Parameters. This sequence allows any number of symbols between * and #. In the field Param 1 specify the layer, where the command formed by the rule will be executed - "1" (the main fullscreen layer). In the field Param 2 enter %1 (it will mean broadcasting the received group number to the service ProgramChannel). In the field Param 3 choose the command that will be executed when the cue-tone appears - PLAY. Note: When hovering the cursor over any field in the window Action Parameters, you will see the hints that will help you to choose the needed variant in the field Param 4. Then press OK to save the settings, click Apply Changes at the top part of the control console window of the server. To provide program switching and the necessary delay after the start of broadcasting the block, you should specify the value Delay in milliseconds.